Last year about this time, I released my Sweet Potato Pie recipe. In the months following the release, Flavorah released their YAM that is out of this world delicious! Summer is close to an end and Fall will be here very shortly, so I felt it would be the perfect time to release my updated version. This version builds off of the original but I added and took away a few flavorings for this version. (You can read my notes on the original version here https://alltheflavors.com/recipes/63611#sweet_potato_pie_by_folkart ). FLV Yam is the star here. It's about as accurate a flavor as I've ever tested. I has a deep yam flavor that is second to none. I also kept the HS Pumpkin Pie but lowered the percentages from the original, just to add a bit of a commercial canned pumpkin/sweet potato aspect to the mix. The DFS Holy Holy Grail is there for the caramel and vanilla almost giving it a "brown sugar" feel to the mix. I stayed with the WF Caramel Rice Crispy Treats because to me, it's flavor is that of the soft pumpkin pie crust that is on the bottom of a pumpkin pie. The caramel also adds to the richness of the mix. CAP Vanilla Custard. 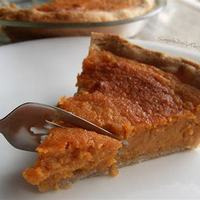 A sweet potato pie is in essence a custard, so by adding this flavoring at 1%, it gives it that sweet custard feel, without taking away from the yam and pumpkin. My original version used CAP Cinnamon Danish Swirl, and while it's a great flavoring to use, the cinnamon can be a bit strong. Wayne Walker reviewed my original version and he did like it very much, but he said he would tweak it a bit by reducing the CAP Cinnamon Danish Swirl. So I took his advise in this version and used WF Cinnamon Pastry because to me it has a slightly less cinnamon note. My first few versions did not have FA Cookie but I felt it was needed to bring home the pie crust note. And I think that it has. One thing that my original lacked, in my opinion, was a buttery note. I have learned that this is a very important note to include in most bakeries. You may ask, "Why FLV Popcorn though?". To me FLV Popcorn is the perfect flavor to add that buttery note. I do use CAP Golden Butter in a lot of my mixes, but it requires a very long steep and sometimes has a plastic note that I can't get past, especially when used at higher percentages. One other suggestion Wayne Walker made in his review of my original was that the TPA Toasted marshmallow was not really doing much in the mix. So I took his advise and removed the TPA Toasted Marshmallow and with the addition of the CAP Vanilla Custard, I agree that it's not needed. I added .5% CAP Super Sweet to liven things up a bit, but you can lower or raise this to your liking. You can most defiantly vape this as a shake and vape, but I would suggest a week steep to let the CAP Vanilla Custard bloom. This recipe is the property of folkart and released under the CC Attribution-Noncommercial 4.0 license. You may not copy, derive or commercialize this recipe without following the terms of this license or the explicit permission of the creator. Been living with this one since I shaked it up. It is definitely shake and vapeable, but it really comes into its own at about 4-5 days, when the vanilla custard blooms. It adds that note that takes this from "Hey, this is a damn good sweet potato pie" to "Put down the pie, and pick up the vape. It's better." I compared and contrasted with one of those Patti LaBelle sweet potato pies everyone was losing their minds about a few years back. You whooped it, hands down. Great seasonal vape, and with a dash of tobacco (got curious), becomes an earthy, woody yet very sweet treat. Long story short? Get you some, man. You won't regret it. This is exactly the pumpkin pie/ sweet potato pie recipe that I’ve been looking for. I was looking around for inspiration and decided to give yours a try and damn, you knocked this out of the park! This is a must mix this time of year! Great job! OK so I just mixed this, cracked the top and smelled it that's it.... The very first words out of my mouth were " Oh my wow" I absolutely cannot believe how authentic this recipe smells it is going to be delicious I will update this review once the steep is over and I vape it. But I know now it's gonna be a 5 amazing work here. Ok on a 10 day steep and dam it boy!!!!!! This stuff is delicious. It offers all the authentic notes of a fresh baked sweet potato pie. Bravo my man, this is a definite banger. This is better than the real thing. I hope to be capable of this level of perfection one day.